It’s been a busy few weeks since Christmas, including being Best Man at my best friend’s wedding on Saturday. I did however manage to get a brief hour in the workshop yesterday to get things set up in advance of spraying the lacquer for the Telecaster build. 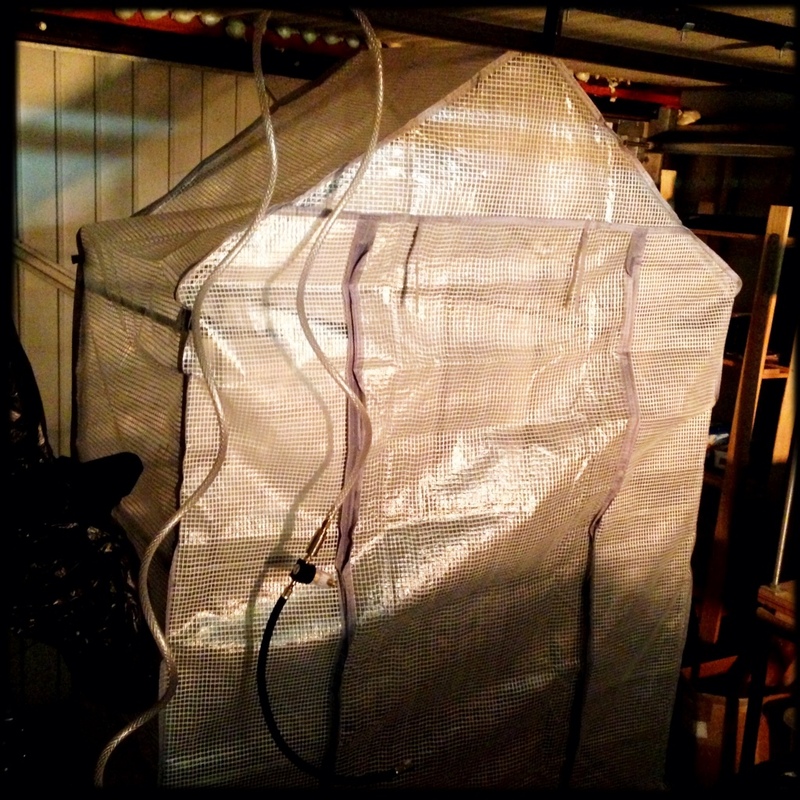 Having tested the compressor and airline equipment I then erected a small freestanding greenhouse to use as a spray booth. Given that my current workshop is a 1950s prefabricated garage I stand very little chance of keeping it entirely dust free while spraying, but the greenhouse should provide a clean space in which to hang the guitar while applying the finish over the next couple of weeks. After a busy December in which I was unable to get into the workshop, I have been making good use of the festive break to get in some good workshop this week. A separate blog post about fretting the Tele-build will follow shortly, but today I want to write about preparing to spray the lacquer. Having finished the fret work just before Christmas, most of this week has been spent final sanding the body and neck to 220 grit to remove any remaining tool marks and minor dings. Because I will be using a water based lacquer I then damped the sanded timber to raise the grain, and then re-sanded with 220 grit paper. 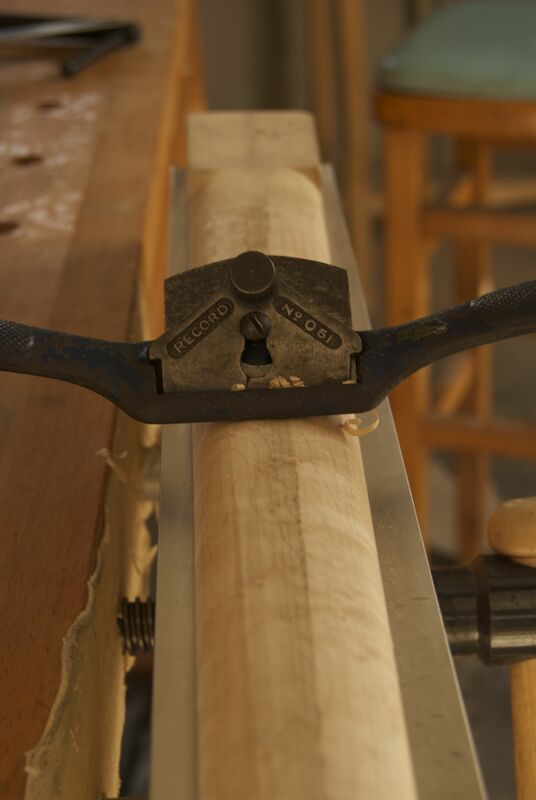 This will ensure that when the lacquer is sprayed the grain won’t fuzz up or warp in reaction to the moisture in the lacquer, particularly on the end grain or the figured maple of the neck. Both the neck and the body were then treated to a coat of amber shellac (mixed to a 2 pound cut) primarily to act as a sealer, but in the case of the neck also to make the figure in the maple really pop. The result is that the birdseye, as well as some lovely and entirely unexpected flame, now really stand out. This neck, complete with the dyed sycamore laminate under the fretboard, and black pearl fret markers, should be very eye catching. 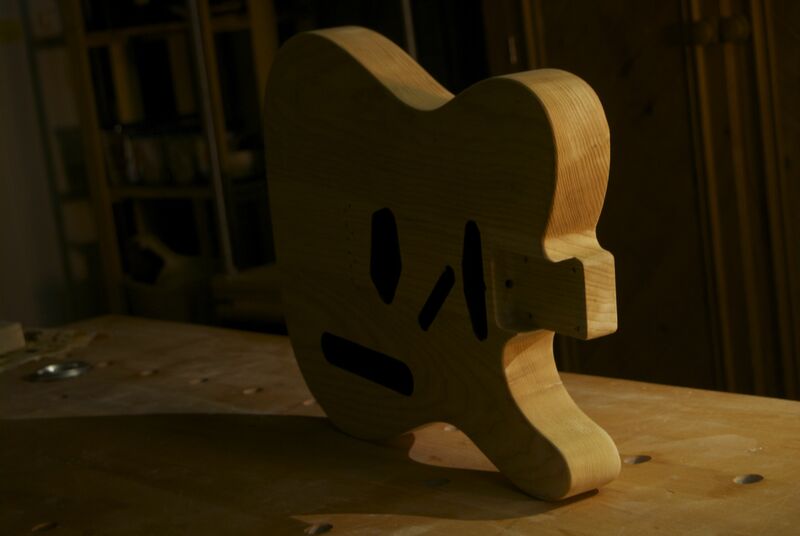 Being an open pored wood, the swamp ash body then needed grain filling. I ragged on a transparent grain filler, and then removed the excess using an old credit card as a squeegee. Once the filler had dried overnight I sanded the filler back with 220 grit paper, and then gave another coat of shellac to really seal the filler in. All that remains on this build is to spray the lacquer, and then do final set up once the guitar has been assembled, and I shall document both processes on this blog. 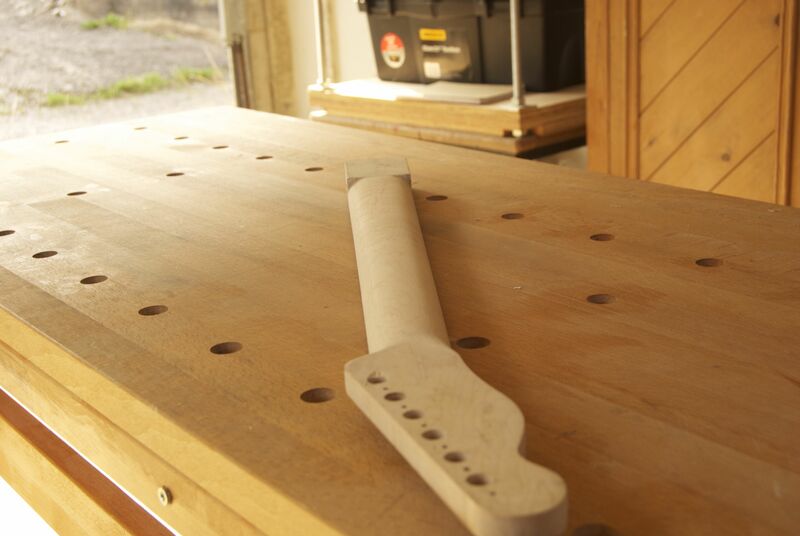 Today I started levelling the frets on the Telecaster build. But before I did so, last night I assembled the full guitar (save for the electrics) for the first time, and put a set of strings on her. 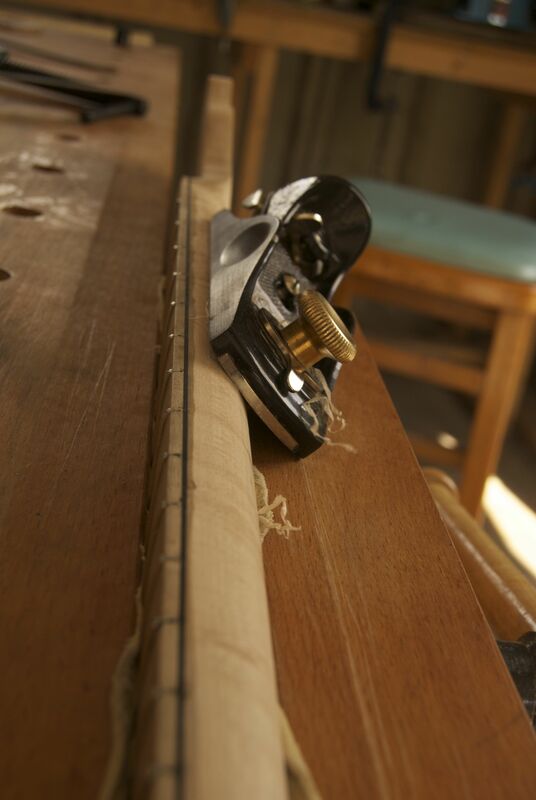 This was mainly to assess the effect of string tension on the neck before working on the frets, but also an opportunity to review the neck shape and decide on any last minute tweaks to the neck profile prior to spraying the lacquer. Of course I couldn’t resist playing her – this was the moment of truth when she stopped being a piece of furniture and started to be a musical instrument! Initial impressions are very good – the combination of swamp ash body and maple neck gives a nice bright, percussion twang, especially when hybrid picking country licks. The vintage neck profile fills the hand, but isn’t not too club-like. That being said, I may remove a little more material between 1st and 5th frets, just to increase comfort a touch. I will write about the fret levelling process in a separate entry. But for now, I shall leave you with a picture of the guitar, strung up, on our dinning room table. Today has been my favourite sort of workshop day. There has been visible progress on the Telecaster build, with problem solving and practice at fundamental hand tool skills along the way. Perfect. 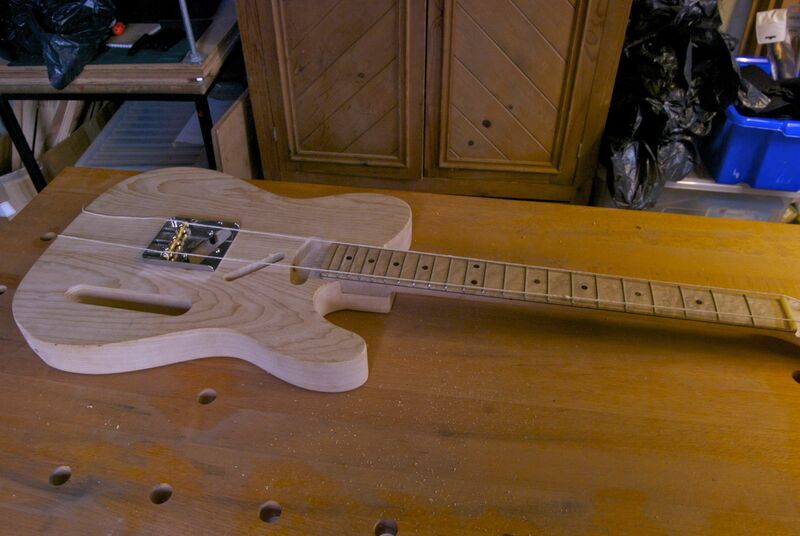 Before the wedding, I had got the Telecaster to the point where the next stage was to fit the neck to the body. 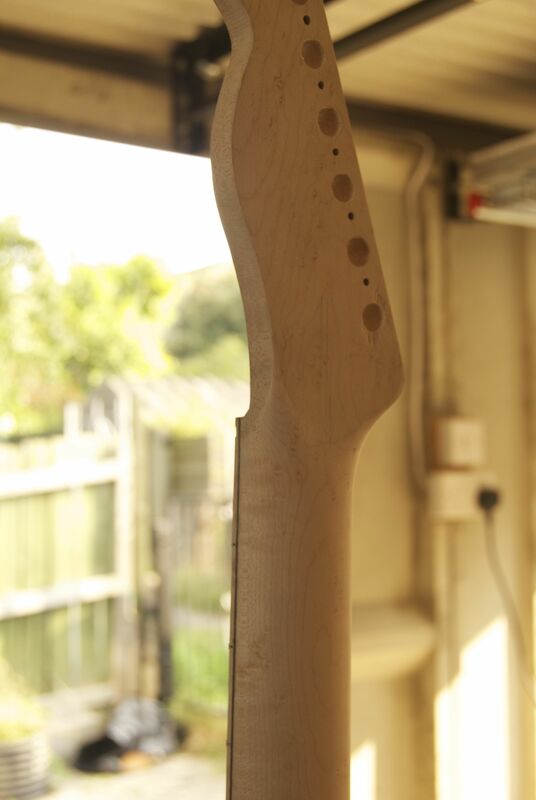 Although the neck pocket in the body was routed early on in the build, fine fitting the neck and drilling the holes for the neck screws doesn’t happen until quite late in the build process. Before I started drilling any holes however, I wanted to fit a more substantial table to my drill press to support large pieces such as the Telecaster body. Out of the box my drill press only has a 4″ wide table, which is fine for drilling small work pieces but is somewhat lacking for larger work. Rather than buy a third party table, I decided to make one out of a spare piece of 1/2″ thick plywood I had kicking about. This would give me a substantial 24″ square table which should be more than sufficient to support any workpiece I’m likely to introduce to the drill press. Having drilled and countersunk the mounting holes, and cut a recess to accommodate the drill pillar, I then discovered that the throat of the drill press wasn’t deep enough to reach the location of the holes on the Telecaster body. Damn. It looked like I was going to have to drill these holes the old fashioned way after all. This wasn’t time wasted though, as it’s a job I’ve been meaning to do for a while. When I next get an opportunity, I’ll also fit a fence to the new table. 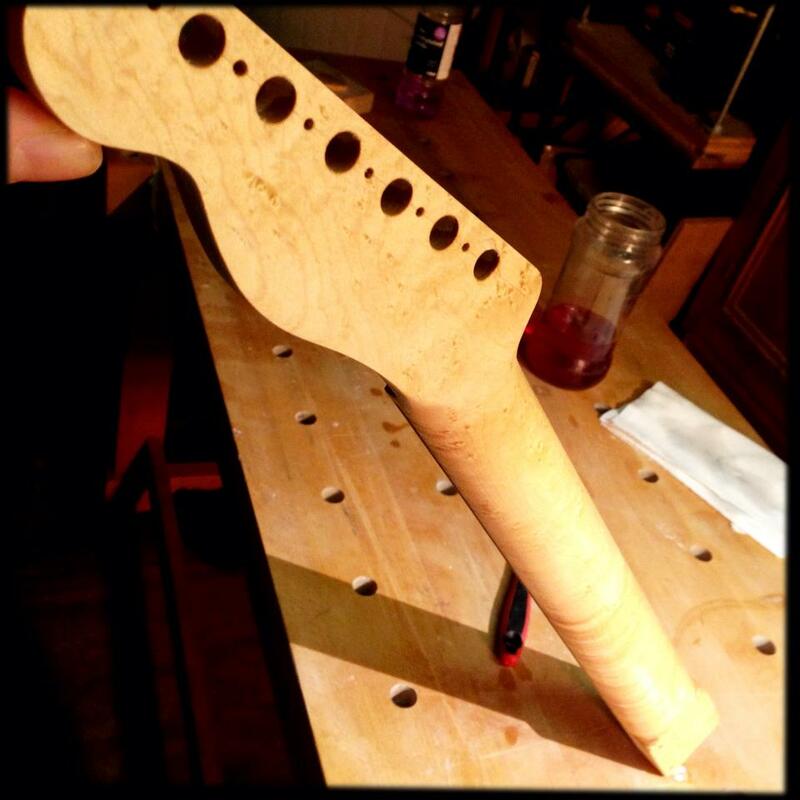 Before I could fit the neck I needed to have the bridge fitted and drill the stringing holes through the body. I screwed the bridge to the bridge pickup (and there will be a future post about pickups in the near future) and placed the bridge pickup in it’s cavity. This then located the bridge in the correct position, which was checked from the front edge of the neck pocket and against the body centreline. 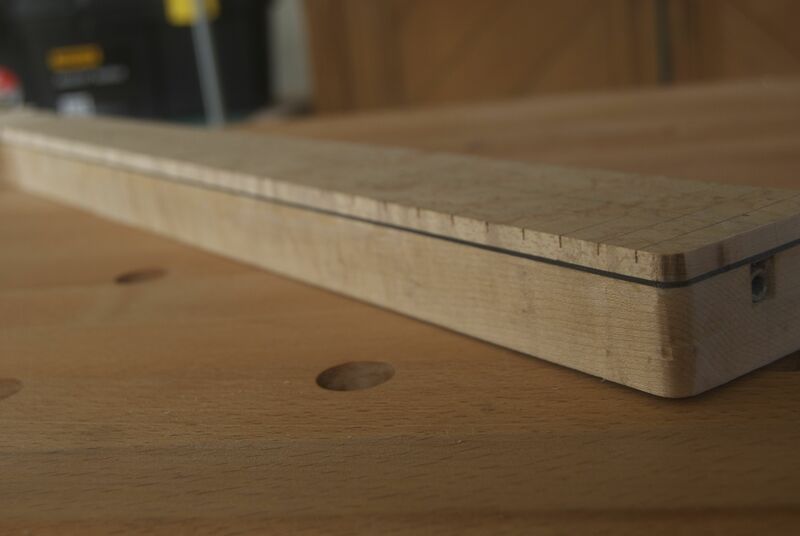 I was then able to drill the four holes for the bridge screws, and the six holes for the string channels, the latter going all the way through the body. Drilling through 2″ thick swamp ash using only a decades old egg beater drill is not for the faint hearted, and a good exercise in drilling perfectly straight. While I was at it, I flipped the body over and widened the string channels (which had been drilled with a 3mm bit) to a 10mm diameter and 9mm depth to accept the string ferrules. Next, and still using the egg beater hand drill, I drilled four holes through the body for the neck screws. Then came the clever bit. The neck currently has a good tight fit in the pocket, but because I have left some room for the lacquer on both the neck and in the pocket itself, there is a little side-to-side play. I want the neck to be dead straight when fitted, so that the outermost strings are a constant distance from the edge of the fretboard. To check this I installed the nut and the tuners for the outermost strings in the neck, and attached the bridge to the body. 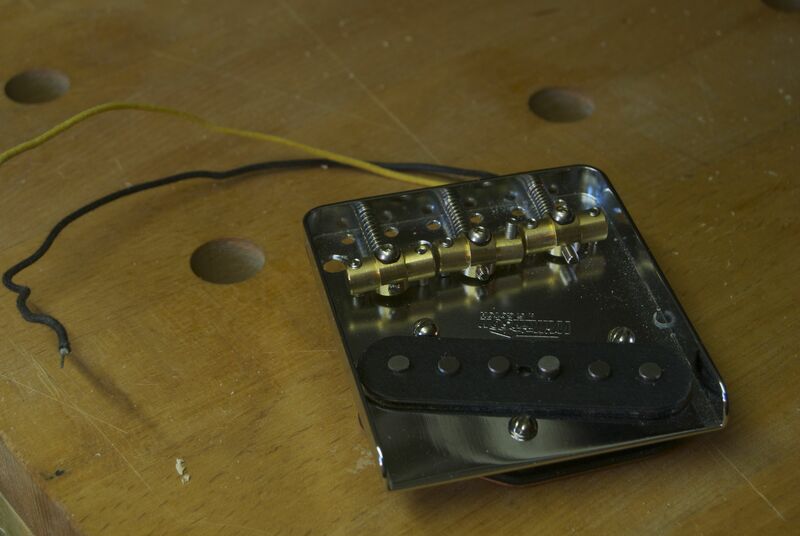 I then ran lengths of string from both tuners to the bridge, adjusting the neck laterally until everything was true, after which I pushed a 3mm drill bit through the holes in the body to mark the position of the four screw holes on the bottom of the neck. After that it was a simple enough task to drill the four holes to depth in the neck (yet again, using the egg beater drill because by this point I was growing quite fond of it).